Natural slate – does size really matter? When it comes to specifying building materials, it’s good to know that some products such as bricks, thermal blocks, wall ties, and even kitchen counter tops and plug holes, all come in one standard size. As well as making it easier to specify and install, it eases production too. So, if that’s the case, why is there no standardisation for natural slate? Well, this is all for good reason. Firstly, slate is cut into all shapes and sizes dependent on the rock, and this makes the choice endless. Secondly, slate is one of the oldest building materials there is, and we have been laying slate in diminishing courses for centuries – using the largest slates at the eaves and smaller sizes gradually being laid up to the ridge. Indeed, some of the world’s most famous historic buildings are testament to this tradition. .
With such a vast choice of natural slate on offer, the question often raised is what’s the correct size slate to choose for a particular project? The answer to this is that there is no set choice, it is dependent on a number of factors. For instance, it can be subject to what part of the country you live in. Whilst the most commonly used slate size in England and Wales is 500x250mm or 20”x10”, this hides a variety of sizes from 400×250 in the North East, to 600×300 in the North West of England, with each region having a distinctive size to create a local ‘look’ and blend with the area. 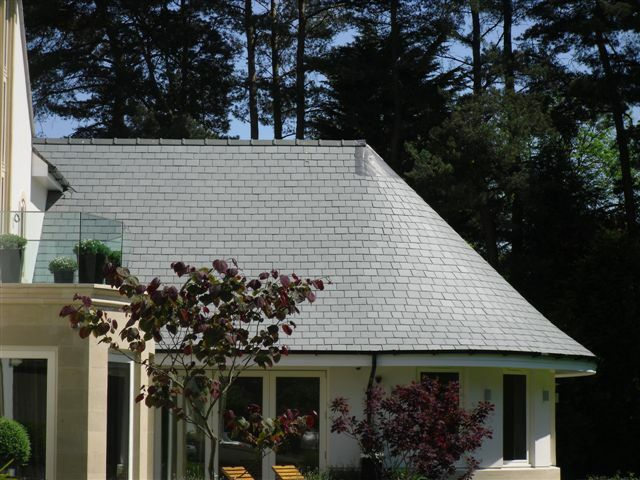 The size of the slate can also be affected by the pitch of the roof and the aesthetic effect that you wish to achieve. For example, smaller slates tend to be used at 30° and above, and often give a different visual effect to using larger slates. Interesting roof patterns can also be created by using a mix of sizes and shapes. Of course, if you’re working on a heritage project or in a conservation area,you will be not only be restricted to the size of slate, but the type of slate itself, in a bid to preserve the historic character of the building. In addition, the size of slate you choose can have a major effect on cost. It’s tempting to think that smaller sizes would be more expensive, but whilst you may require more slates per square metre, they can still becompetitive. And, remember, the size selected will also affect the quantity of batten and fixings required. So, when it comes to natural slate sizes, your options are infinite. Does size really matter? Not always. If you always choose the same slate, why not be daring and try something different? As long as you don’t sacrifice the quality of slate, you could achieve a new look and even save on costs too.